UCC630 30 inch Under-Cabinet Range Hood in Stainless Steel Enhance your culinary experience with the UCC630 under cabinet range hood. With a professional design this range hood features a powerful motor for strong ventilation. The 3-speed electronic controls with delay auto shut-off function are efficient and easy to use, and the long lasting, high output LED lights are an eco-friendly way to brighten your cooking surface. The stainless steel baffle filters will maintain their luster even after many washes keeping your range hood looking as beautiful as the day you bought it. The UCC630 combines powerful performance, easy-to-use features, and a design that will give your kitchen a professional look. 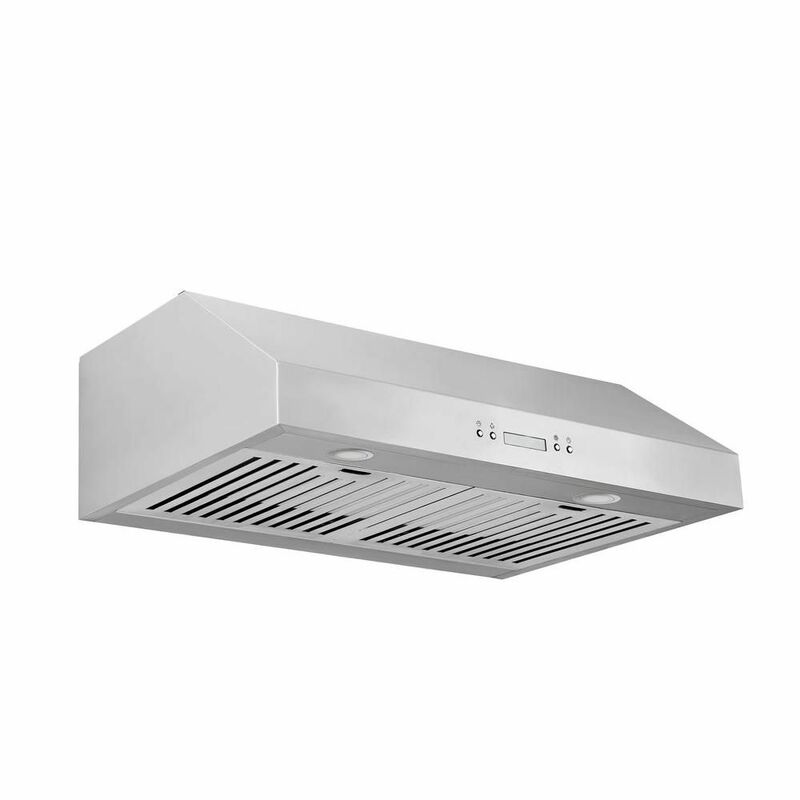 UCC630 30 inch Under-Cabinet Range Hood in Stainless Steel is rated 4.1 out of 5 by 13. Rated 2 out of 5 by Haoao from It is quite noisy on lower speed but it is... It is quite noisy on lower speed but it is slightly quieter on higher speed. Rated 4 out of 5 by Luong from noise, but strong.... noise, but strong. Rated 4 out of 5 by Lou from The stainless is thin and causes minor vibration. The... The stainless is thin and causes minor vibration. The stainless has lots of swirls in the stamping. Rated 5 out of 5 by Geovanny from Installation is very nice and easy. powerful 3 speed fan. Nice when you turn off the unit and bac... Installation is very nice and easy. powerful 3 speed fan. Nice when you turn off the unit and back on again later on during the day or week it goes back at the same speed. Delay fan, if you finish cooking but still want the fan on for a few more minutes, just activate the timer and it will turn off by itself. LED is very powerful and bright. Saves on electrical bill. Note: During installation, cover it until its ready to be used. Material is fine and light which means scratches easy. Make sure you clean after every cooking as grease/sauce fly's up. Easy plug as all other fans. Depth comes out like the stove so be careful the height of the vent. Enjoy. I had to shrink my top cabinets, Adjusting the doors this weekend. Yes I had to shrink the bottom as well 8''. Rated 4 out of 5 by jobrob from The hood is working very well however........ when we took... The hood is working very well however........ when we took it out of the box, the back end was dented. I needed it installed that day, so thankfully, the dent does not show. Make sure you check it out before installation . The hood has great power and great light. It is a bit noisy, but not a big deal. My only wish is that the ACONA label would not be on the front !!! The picture on the Home Depot site shows a blank front !!! Rated 3 out of 5 by Mark from Does the job but way too noisy. Looking for some... Does the job but way too noisy. Looking for some sound deadning material to glue to the inside. Rated 3 out of 5 by slick from It's a nice clean looking unit, lighting is very good, even in rear burners. My only complaint wo... It's a nice clean looking unit, lighting is very good, even in rear burners. My only complaint would be the noise level at mid and high speed. I would recommend putting foam insulation between cabinet and unit to reduce vibration and noise.